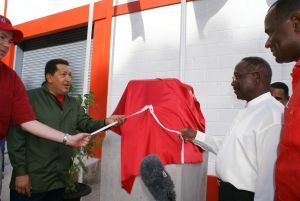 The Dominican leader made the statement in an address at the formal opening of the facility at Jimmit last Saturday, to coincide with the second official visit by the Venezuelan President, His Excellency, Hugo Chavez Frias to Dominica. The Prime Minister recalled that there was much criticism of the PetroCaribe initiative when it was first announced in 2005. “In 2005 when Dominica along with other Member States of CARICOM signed on to PetroCaribe there was much criticism of this very important initiative. But as the Prime Minister of Dominica, I always told you that this agreement was a progressive one. It is an instrument which seeks to address social and economic inequality between countries and within countries,” Prime Minister Skerrit told a large crowd at the ceremony. PetroCaribe in large measure has been the lifeblood of the economies of several countries who are participating, Hon. Skerrit stated. Hon. Skerrit also mentioned those who were sceptical of his decision to join the Bolivarian Alternative for the Americas (ALBA). “Just over a year ago Dominica became the first CARICOM Member State to sign on to ALBA. You know the tremendous untold criticism which was levelled on Dominica’s membership of ALBA. And you recall in a national address to Dominicans I said to you and the world there was no devil in ALBA and there was no devil in PetroCaribe,” the Dominican leader stated. Dominica joined ALBA as a matter of principle “because in large measure I appreciate and the Dominican people appreciate the commitment of President Chavez to addressing social and economic inequality among the poor peoples of our region”. The Prime Minister spoke warmly of the commitment of President Chavez to the people of Dominica and the region and recalled how he sought the help of former Cuban President, Dr. Fidel Castro Ruiz in arranging his first meeting with the Venezuelan Leader. “We must recognise the tremendous commitment of President Chavez and the people of Venezuela. This is a leader with a vision. This is a leader who is prepared to use his resources to extend a hand of friendship to many countries, including Dominica and we thank God for Hugo Chavez, the President of Venezuela. I am very proud to say that I am a friend of Hugo Chavez and Dominica is a friend of Venezuela,” said Prime Minister Skerrit to rapturous applause from the appreciative crowd. Venezuela was the first country to establish diplomatic relations with Dominica after the country gained political independence from Great Britain in 1978. But the Prime Minister explained that in the last few years Dominicans have seen the “expansion, the broadening and the strengthening of the bilateral relationship between Venezuela and Dominica”. According to the Dominican leader, the new $35 million Plant is expected to bring tremendous benefits to the people of Dominica. The facility, funded jointly by the Government of Venezuela and the Government of Dominica has the capacity to store 25,000 barrels of diesel, 10,000 barrels of gasoline, 2000 barrels of A1 Jet Fuel and 2000 barrels of Liquefied Petroleum Gas (LPG). Every centenarian in Dominica will receive free Liquefied Petroleum Gas (LPG) and the commodity will also be distributed free of charge to some of the poorest families in Dominica. Prime Minister Skerrit pledged to work with other PetroCaribe member states to bring greater attention to PetroCaribe at the United Nations General Assembly in New York later this year. The Prime Minister called on other countries in the world to follow Venezuela’s lead and extend “their hand of friendship in their regions and across the world”. The Prime Minister also indicated Dominica’s willingness to work with Venezuela in fine-tuning the new financing mechanism utilizing the ALBA bank which he said would bring greater benefits to all PetroCaribe member states. “The presence of so many thousands Dominicans is testimony to our gratitude and our extension of thanks to you. And we say thank God for Chavez, and thank God for the people of Venezuela and thank God for ALBA and thank God for PetroCaribe as we continue to work together in strengthening our hands of friendship and reaching out and addressing some of the social and economic challenges in Dominica, Viva Venezuela, Viva Dominica, Viva ALBA, Viva PetroCaribe,” Prime Minister Skerrit concluded to an unending chorus of thunderous applause from the huge gathering.